Which of these three look the same? First, we have the E-Power, by FuturePower. Next, we have eMachine's eOne. 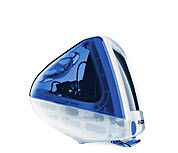 Last, we have Apple's iMac. How similar are the first two machines to the third? Here's my take. There is little doubt that the first machine here, the E-Power, very closely resembles the iMac. However, there are small differences which separate the two. First of all, there is a floppy disk drive port in the front. Secondly, there are no visible speaker grills in the front. Third, the base on which the computer/PC sit upon is different than the iMac's solution (presumably, this is where they stuff the computer). Are the similarities enough for Apple to be successful in a lawsuit? Perhaps, though the two do have distinct visual differences. The saving grace for the E-Power is that it is a Windows based PC. Though it shares the same lines and contours of the iMac, it's differences in hardware location and content are clearly evident and thus become the undecided factor. The similarities between the eOne and the iMac just don't exist, however. The fact that the colours of the two machines is similar just isn't going to cut it. There is no way anyone would mistake an eOne for an iMac. The profile, the lines - the overall shapes - are just totally different. The fact that one's a Wintel machine and the other is made for the MacOS divides these two machines further. If Apple is successful at suing eOne, I'll be very surprised. Although obviously inspired by the iMac, it's pretty clear that engineers at eMachines did their homework and came up with their own design concept, rather than rip off Apple's design as is claimed. Verdict: I can see enough similarities in the design of the shell of the E-Power and the iMac for Apple to have a case. Whether they are successful or not will depend on the court. I can't say whether or not they will be successful, since there are differences, though I don't know if there's enough. However, I'll have no faith in the justice system if Apple is successful at suing eMachines for their eOne, which is clearly different in design and content, even if the colours are the same. *UPDATE* Well, I was correct in believing that Apple may have a case with E-Power. The courts have decided that there are just not enough differences. Check out the news at CNet news here. Well, that's round one. Let's see if Apple can make it two for two (I'll be very surprised). Which one out of the three would I choose? None of the above. I like my computers big and modular, whether it's a Mac or PC, thank you. Whether PC or Mac? I like all computers out there and own both a PC and a Mac, so I tend to think my perspective is balanced. Both have advantages and flaws which pretty much balances things out. Want to talk to me? e-mail me at psquirk@hotmail.com, and perhaps I'll dig your message up through all of the junk mail I receive at that address. *-Mackido tends to be extremist. They tend to be overly general and vague in their comparisons, and one who's familiar with both platforms (such as myself) find that they are comparing outdated, low-quality PC's with modern, top-of-the-line Mac's. Therefore, their findings are typically slanted and as such should be used for entertainment purposes only. I take no responsability for any embarassment you may endure from using their information in any kind of a discussion or debate. **-Smackintosh dwells on the negative aspects of the Macintosh. Though not as extremist as Mackido, this site is, once again, for entertainment purposes only, since everything is typically slanted towards the PC. However, it would appear that the information here is more current than the data used by Mackido. However, the same disclaimer applies: You use the information here at your own risk. ***-I haven't found anything slanted about the information at Ars-technica; they seem to be on the level when reviewing hardware. However, I have detected some tounge-in-cheek humor directed at the Macintosh community, so even though you may find a positive review of a Macintosh product, be aware that it's possible for the Macintosh user to get offended.